Tazawako, the deepest lake in Japan with a depth of 423.4 meters, has near its shore a bronze statue of the legendary maiden of beauty, Tatsuko. 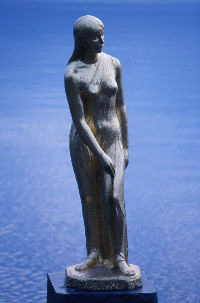 Tatsuko, wishing for undying youth and beauty, is said to have been turned into a lake-goddess. Tatsuko now stands with her back to the clear blue waters, a figure of pureness and beauty.